Matje, Martin. Very Good. Stuart Goes to School by Pennypacker, Sara. Trade paperback (US). Glued binding. 55 p. Contains: Illustrations. Intended for a juvenile audience. Matje, Martin. Good. 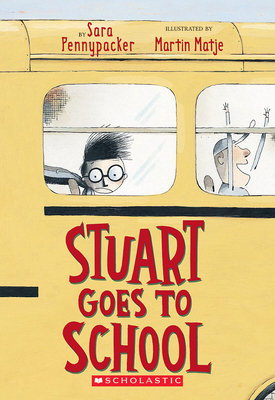 In this hilarious sequel to "Stuart's Cape, " Stuart is on his way to the first day of school. With his cape, though, Stuart is bound to have a day full of wacky adventures. Illustrations. Trade paperback (US). Glued binding. 55 p. Contains: Illustrations. Intended for a juvenile audience. Matje, Martin. Very Good. Stuart Goes to School by Pennypacker, Sara. Sewn binding. Cloth over boards. With dust jacket. 55 p. Contains: Illustrations. Intended for a juvenile audience. Fine. 0439301831 Ships from Tennessee, usually the same or next day. Very Good. 0439301831 Ships from Tennessee, usually the same or next day.